I usually prefer to prepare cutlets or tikkis over the deep fried pakoras for obvious reasons as they are low fat and bit guilt free to indulge them. The options for cutlets are endless like you can create your own cutlet by adding the ingredients of your choice. Basically you need a base like potatoes or bananas or yam or mixed vegetables or cooked lentils or oats etc and a binding agent like chickpea flour, bread, maida or corn flour and few spices and herbs to prepare cutlets. You can create a cutlet on your own based on your requirements. The options with raw banana are limited, I usually end up preparing a stir fry for rice or a simple sabzi for rotis regularly and these Raw Banana(Kele ka) Pakoras on rare occasions. You can even use raw banana to make cutlets or kebabs like I did. As the raw bananas are mildly sweet make sure you added enough spices and herbs to make it spicy and aromatic.These kebabs taste best when deep fried as the raw bananas are slightly sticky in nature but you can make it low fat by shallow frying it.The texture of the kebabs is definitely better when deep fried but the taste of shallow fried is even good. These kebabs make a nice starter in parties when served with tooth pick pricked in them. I had actually prepared them to prepare Kofta curry as I use a same base for koftas as I do for cutlets/kebabs.I would post the kofta curry soon and I thought that I would share a separate post for preparing these kebabs. Cut the ends of raw bananas and cut them into 2-3 pieces and pressure cook along with potato for 3 whistles. After it cools down, peel the skin of raw bananas and potato and mash it nicely using potato masher while it is still warm and keep it aside. Dry roast chickpea flour until you get nice aroma from it and let it cool. Add all the masalas - red chili powder, coriander powder, cumin powder, turmeric powder , garam masala powder and salt to the mashed raw banana and potato mixture and mix it nicely. The mixture would be very soft and mushy at this point. Add finely chopped onion, green chillies and coriander and mix well. Now add roasted chickpea flour and mix nicely, do not add all the quantity of besan at once, add in small portions and mix until you feel the mixture is not very sticky. Do not add more besan, the kebabs would be softer when the dough is slightly smooth instead of stiff dough. 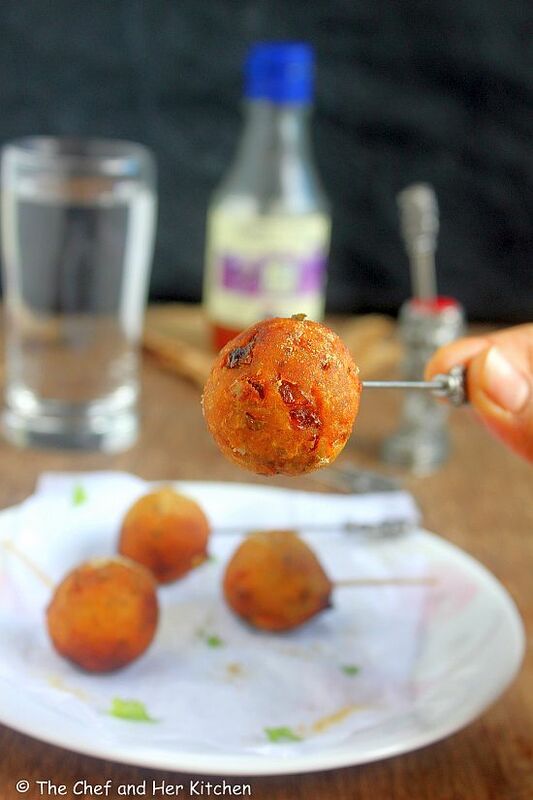 Grease your palms with oil and make gooseberry sized kebabs or like regular shaped cutlets and try to stuff raisins in it - by initially making it like a cup and stuff raisins and close it to form a round kebab or flattened tikki. Refrigerate them for half an hour so that they will firm up slightly, you can use them immediately too if you are short of time. Heat oil in a deep curved pan until it is hot and add kebabs and fry them on medium flame until they turn in deep brown color. Remove them with the slotted spoon on to a kitchen napkin. If You have prepared them in the shape of flattened tikkis(cutlets) you can shallow fry on tawa with 1-2 tbsp. of oil and fry them on both sides. 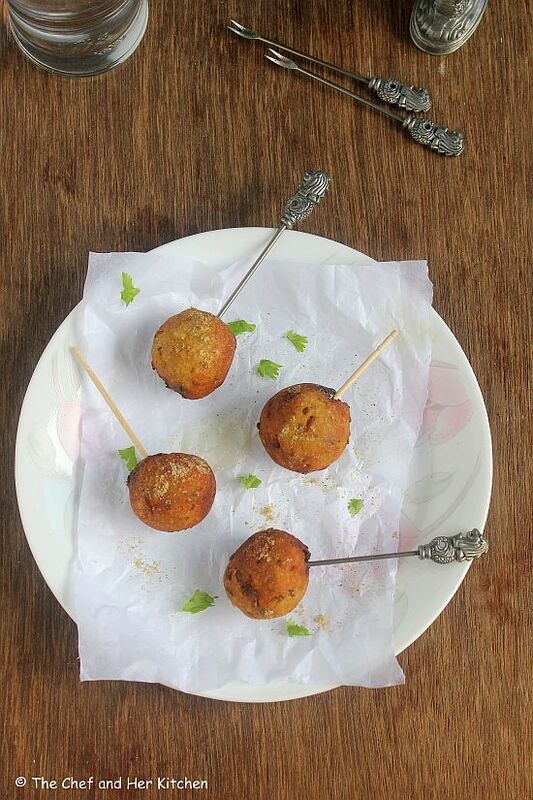 If you are looking for healthy option to fry round kebabs - you can fry them alternatively in an Aebliskever pan. Heat the pan and add 1/2 tsp of oil in each impression and when it is piping hot keep the flame on LOW and place the kebabs in it and fry them by turning them slightly in between until they get roasted on all sides. Sprinkle Chaat masala on them while they are still hot and serve them immediately with Tomato sauce of Green chutney and Meeta Chutney. Kebabs can be deep fried or shallow fried or oven baked according to your choice. 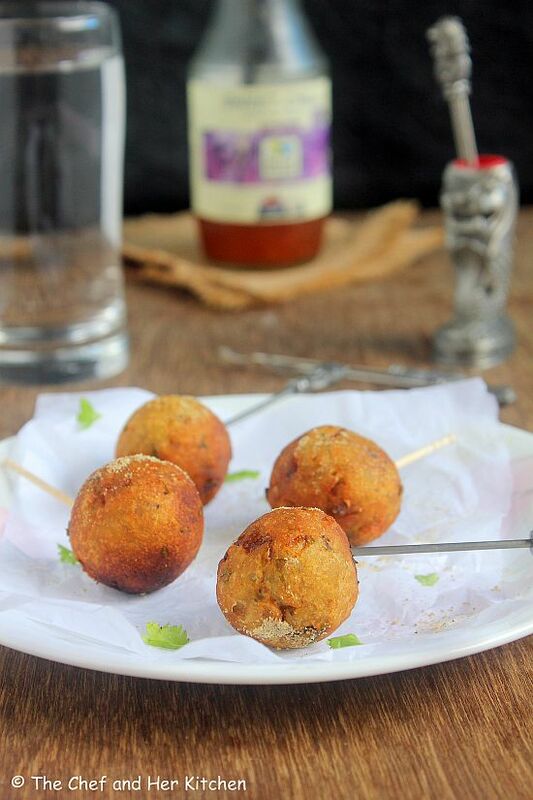 Deep fried kebabs has better texture when compared to shallow fried or oven baked ones. You can replace raw bananas with yam or arbi(taro root) and follow the same recipe. The addition of chopped cashew nuts would add nice bite to the kebabs, you can add them if you like. If you add the raisins directly to the dough there might be chances of they getting burnt if it is deep fried in oil. I did this mistake and I would not like you to do the same and hence always stuff the raisins inside. You can even add 1-2 bread slices as a binding agent instead of chickpea flour in the recipe. Boiled peas can also be added along with potatoes and raw bananas. In that cade do not mash the peas nicely, leaving them slightly coarse adds a nice bite. to the kebabs. As I prepared this to make Kofta curry I made it round and deep fried otherwise I would go for flattened cutlet and shallow fry. But it is a good idea to serve the kebabs with a tooth pick for parties,it makes a nice starter. 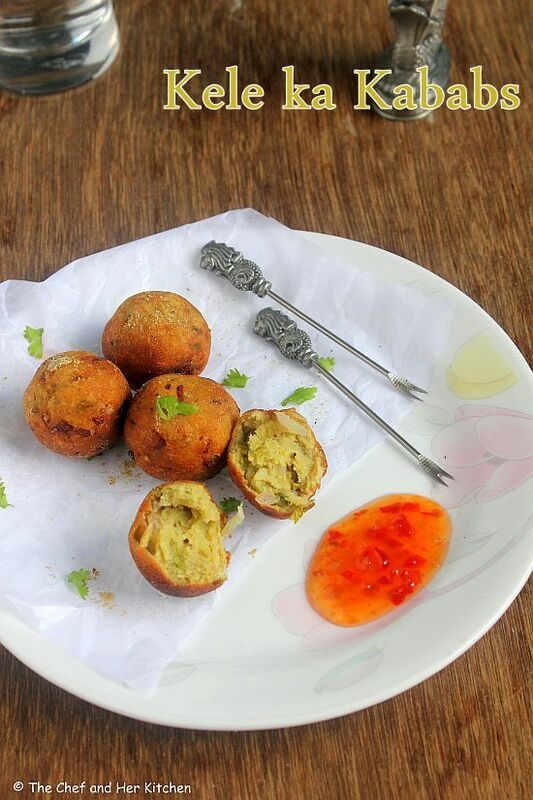 You can use these deep fried kebabs to make kofta curry, which I will post soon. I love raw bananas, as chip or in curry. My mother used to make these kind of kebabs. Like the post. one of my most fav. snacks. such lovely tempting clicks. So well prepared and explained.